On the list of superficial worst nightmares, kids throwing paint ranks pretty high for me. 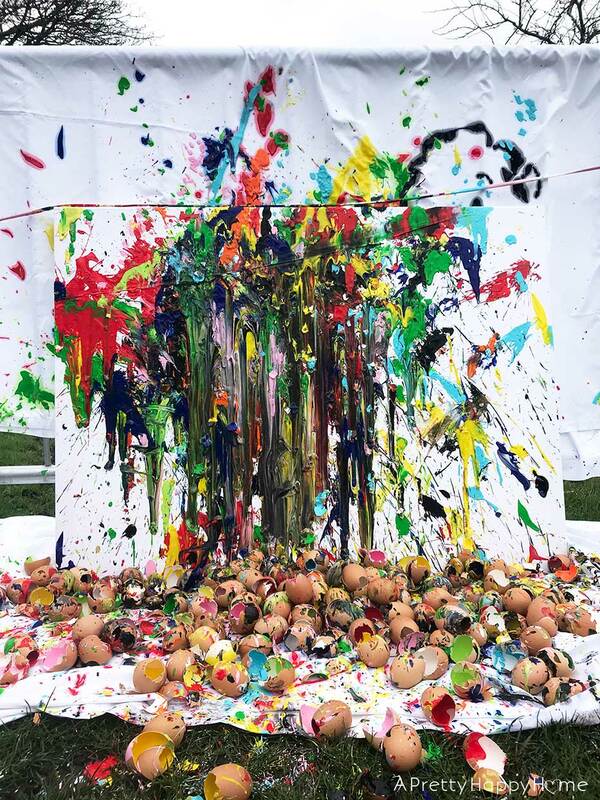 Twenty kids ages 4 to 11 filling eggshells with paint and throwing the eggs (hopefully) at a canvas? What could possibly go wrong?!?! Oh, I could think of one or a million things! Especially when I saw there was a bottle of glitter paint. Now there’s paint AND glitter? I am not ashamed to say it was one of those ‘back slowly away and let the other moms handle it’ kind of moments. As you can tell, egg painting was not my idea. This is why I am thankful for braver, more creative, more patient moms than me. They deserve all the kudos in the world. Here’s how the egg painting situation came about and what I learned from the activity. A mom in my children’s school saved eggshells for a year in order to do this project. A YEAR! This involved carefully cracking the eggs, washing the shells out, drying the shells and saving them in egg cartons. Did I mention FOR A YEAR? Holy cow chickens. It might have been easier to ask other families to save eggs for a week, but she was dedicated to this idea. I’m trying to think if I’ve ever been dedicated to such a crafty cause and I’m coming up blank. She also bought a large canvas and a whole bunch of paint for the kids to use for this activity. Not only is she dedicated and good at advance planning, but she’s also generous and quite possibly a saint. I don’t know which tutorial she used, but this one in particular at Growing a Jeweled Rose suggests pre-filling the eggs with paint (you can use acrylic or children’s washable paint ) and covering the hole in the eggshell with glued-down tissue paper. The moms at my children’s school fully embrace sensory activities and letting kids help out wherever possible. 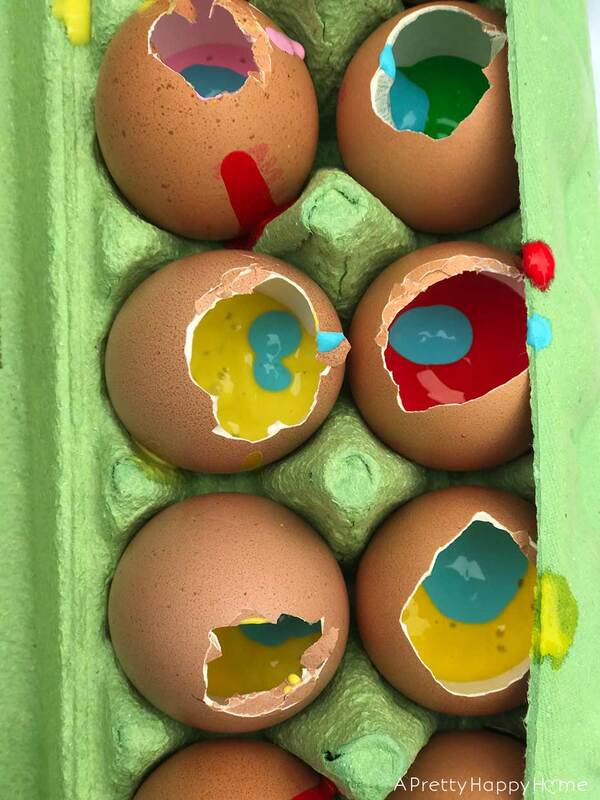 So, in this instance, the kids filled the eggs with paint themselves. If you refer back to one of the above photos, the kids made the executive decision to put more than one color of paint in some of the eggs. I love that. After all, you want to make the paint splatter count. Filling the eggs was half the fun and made the activity last longer than 17 seconds. We did skip the tissue paper part. When all the eggs were filled, I took another step backward the kids formed a semi-circle around the canvas and let those eggs fly! 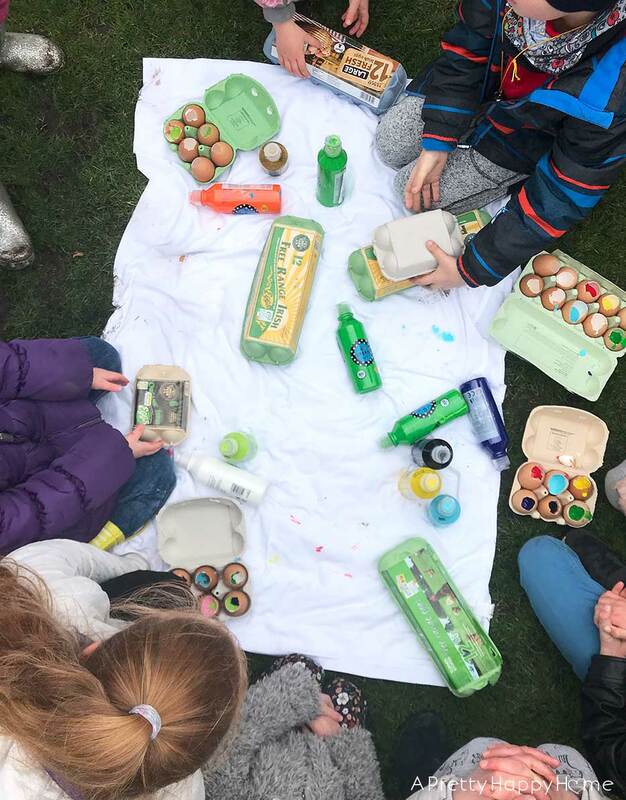 This egg painting activity was done in a public park before an Easter egg hunt. That dads were hiding chocolate eggs while the kids threw paint-filled eggs. If you decide to do egg painting, you’re going to need a place to put your canvas. Our canvas was propped against a metal railing because it happened to be there and convenient. The moms put a drop cloth or old sheet underneath and behind the canvas. Do not skip this step – whatever you do. They were really trying to be good park patrons since this wasn’t a sanctioned activity. However, putting down the sheets was a happy accident because it made cleaning up the eggs so much easier. They just picked up the sheet and dumped it all in the garbage. 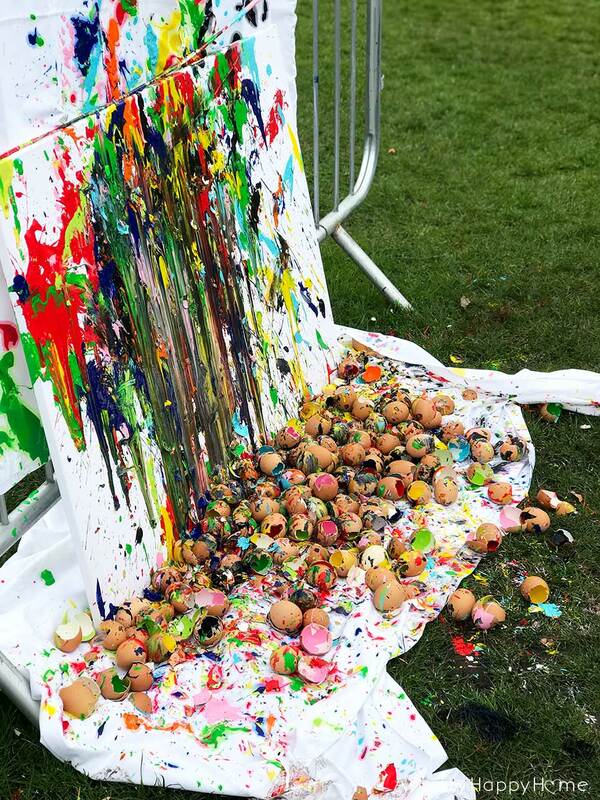 The sheet behind the canvas was also a happy accident because some of the kids don’t have the best aim and you can see that the sheet caught a lot of the foul balls runaway eggs. 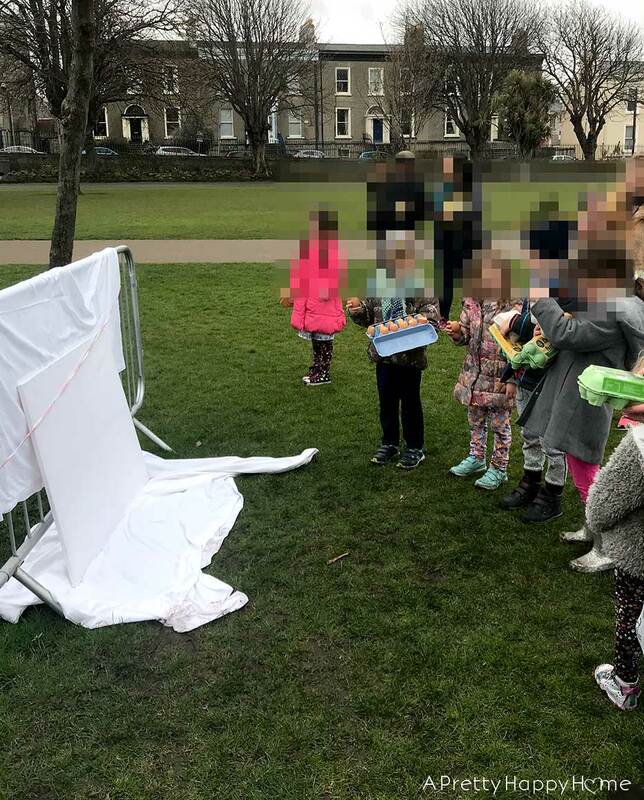 The eggs don’t always break upon impact, so the little kids just kept picking up the eggs and throwing them again. Sometimes they added more paint. Sometimes not! The painting is going to be donated to the school to decorate one of the hallways. As is usually the case, my inner freak out was all for nothing. The kids were so good. There was a little paint on the hands, but of course, 15 moms whipped out baby wipes and cleaned everyone up. When it came down to it, this activity seemed very therapeutic! No joke. I really wanted to throw an egg. But I didn’t. I should have. But I didn’t. It looked fun though. Do you ever have those moments where you are just SO THANKFUL for your tribe? Your village? The people who add dimension to your life experiences? The people who graciously do the stuff that you aren’t good at, but they are? I am so thankful for these people and happy my kids could share this experience with them. See? Told you I learned a lot. About life. If your inner self freaks out from time to time, you might like one of these posts!